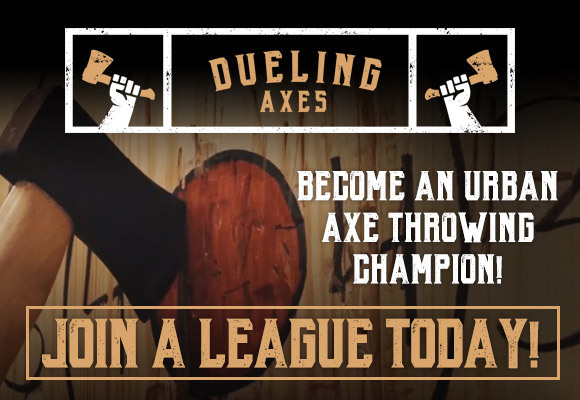 Make your axe throwing reservation online using our scheduling calendar. You’ll receive a confirmation email with a link to our waiver and membership application (you can fill this out on site, before your reservation as well). When you arrive and check in, one of our friendly staff members will teach you to throw like a pro and do it safely (about 10-15 minutes). After the brief training session, your group will be guided to your dedicated throwing lane. Your reservation time begins once you start gameplay on your own lane. Our axe throwing lounge is BYOB and outside-food friendly so feel free to bring your own beer or wine in while you’re throwing at Dueling Axes (Sorry, no liquor allowed). Water and other non-alcoholic beverages are welcome also. What about food? You can bring any food in with you as well, along with grabbing a bite from any of our neighboring eateries. We hope to soon be a food truck destination with the very best of what Columbus has to offer right outside our front door. Our lounge is spacious, comfortable and filled with great music. Your group will have its own seating space right in front of your throwing lane. That’s all there is to it! Check out the FAQ page or drop us a line if you have any other questions! Ready to start throwing some axes? Book your reservation here. With your dominant hand on top, grip the base of the axe handle firmly with both hands Don't squeeze. Making sure the blade of the axe is pointing towards the target, raise the axe over and behind your head, gently rocking back on your dominant foot. Step forward with your non-dominant foot while bringing your arms forward in a throwing motion. Then, with your arms extended forward, release the axe towards the target keeping your wrists in line with your forearms.